My Notting Hill: A Polaroid in the Mail! A Polaroid in the Mail! My etsy order from Polaroids and Pinholes arrived! It's entitled Blue Sea Holly - I find the colors so appealing. Rowena Dugdale is an artist based in Bristol, UK whom I found out about via Beach Bungalow 8. Maybe there's a polaroid with your name on it waiting for you to discover it! 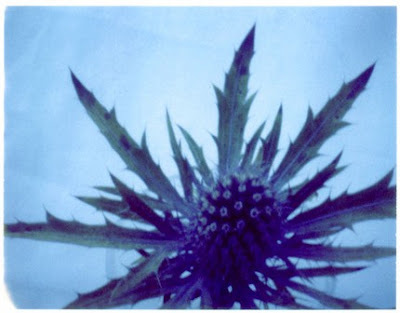 that reminds me of Eyeore's thistle. nice image. Oh wow! that is totally worth waiting for - what a lovely picture !